Experience a fantastic view of the mountain and the coastal line. Witness a unique climate change from lowland to high mountain level. 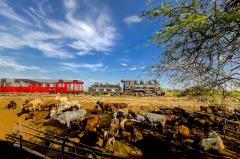 Visit local hacienda and participate in the programs which support the local community. Our journey to the Andes begins in Duran train station where we will board a convoy pulled by a carefully restored steam locomotive. The roaring engine, steam whistles and steel wheels over the railways will take us back in time to the early XIX century and the adventurous experience that is the Tren Crucero. Our first stop is Yaguachi, where we will switch engines to a diesel-electric and continue our trip across vast plantations of sugar cane, banana, rice and pineapple until we reach the Naranjito station. From here we will board a bus which will take us along a road that climbs to the Andes, a scenic trip in which we will ascend more than 2000-metres in just 4-hours. You will notice the abrupt changes in climate, vegetation and geography as you head further in to the Andean mountain range. Your day ends at your hotel in the small town of Alausi which is nestled in the sharp mountains. As you walk through the streets at night you will feel like you have stepped back in time. Today begins with an impressive trip aboard a different train which dates back to the twentieth century. 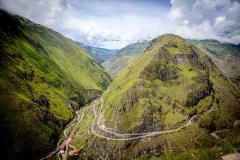 The train descends through the fearsome pass known as La Nariz del Diablo, the Devil's Nose, an intricate switch-back that descends 511-metres in just 12 kilometres. At the bottom you will reach Sibambe Station, a small community which relies heavily on the presence of tourists from the train. Back in Alausi time will be allowed to visit the local market, one of the most colourful in the area and serves more than a dozen surrounding communities. You will then arrive at Colta where the "Black Monster" sits ready to pull our train, an impressive Baldwin steam locomotive that has been carefully overhauled. Here we can visit the first church to be built in Ecuador known as the Balvanera or alternatively you can witness the switching of the trains. The train will travel through fields of quinoa, potatoes, onions, corn and other crops as we arrive to Chimborazo, the capital city of the province of Riobamba. This is an enchanting city where you will have time to wander the cobbled streets and squares. This morning we will be treated to a visit to the community of La Moya who will teach us about life in the Andes and their rich history. You will then continue towards Urbina station. Located just over 3.600-metres above sea level you will learn about the "paramo" ecosystems on the outskirts of Chimborazo. Baltazar Ushca, the last ice merchant of Chimborazo will tell us his story and explain the reasons behind his dedication despite the opposition and arrival of machines to the country. The train will travel through the valley near Cotopaxi, enroute you will be visited by a group of devils (Diablada de Pillaro) which will jump aboard with a parade of colours, music and joy that reminds us of the spirit of the Andean communities. The final stop today will be at Latacunga station from where you will be transported to your accommodation. Heading off this morning you will travel to the Cotopaxi National Park from where you will embark on a moderate walk around the Limpiopungo Lagoon where you will see a range of plants and birds which have adapted to the altitude. Continuing on you will round the slopes of Cotopaxi until you reach a traditional Andean hacienda where you will be part of the daily activities with its inhabitants. You will be welcomed by Andean cowboys, the "Chagras" who will show their skills as riders and teach you about their culture and traditions. You final expedition of the day ends at Eloy Alfaro station with a short walk inside the property where the guides will teach you about it's history before continuing on to Quito, the capital of Ecuador. Tren Crucero has 4 carriages. 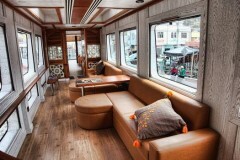 The first two carriages contain tables and chairs for passengers to chat and admire the scenery. The third carriage is a coffee bar. The fourth carriage is divided into two sections, with a lounge and an open air terrace. It gives you an opportunity to enjoy some fresh air while chatting with friends. The train can carry 50 passengers. D’Franco is a standard and delightful hotel in the Bucay. Bucay is one of the most natural cantons in the province of Guayas. It is located to the east of the province to 99 km. Of Guayaquil, at the foot of the River Chimbo, in the middle of the provinces of Los Ríos, Bolivar, Chimborazo and Cañar. It has a pleasant climate that makes it a magical place, to take advantage of many tourist activities. 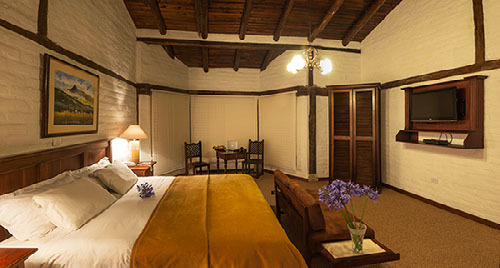 Hacienda Abraspungo is set in a country-style house with elegant Colonial décor. 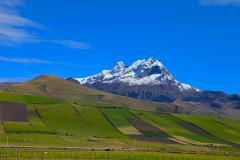 The hacienda is located on the way to Guano in a residential area in Riobamba City. 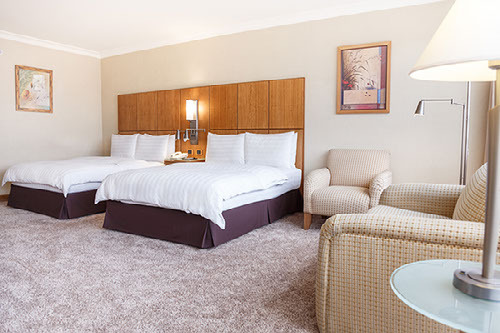 Swissotel Quito is one of the city's luxury hotel, conveniently located in the Floresta neighbourhood of Quito – both a commercial and residential area, only at 25 minutes of Mariscal Sucre International Airport. Each of Swissotel Quito's 232 elegant guest rooms and 43 executive apartments are air-conditioned and feature modern design. 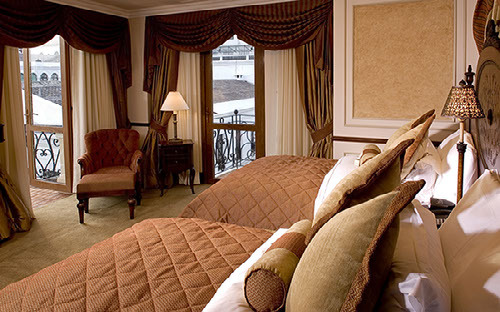 Luxurious amenities include state-of-the-art technology and a free internet connection. La Danesa was erected in the last decades of the XIXth century while the railway was being built. Situated next to the tracks –there has been a stopping place outside the property since the construction of the railway- the Hacienda benefitted from the proximity to the tracks to move its produce to the markets. 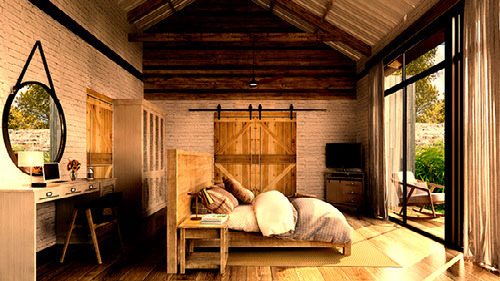 This lush family-owned 500 hectare dairy, cocoa and teak wood farm is also a unique tourist destination. Here guests will enjoy an unmatched farm-to-fork tourist experience and exclusive accommodation in Montubio-style decoration. The Luxury Experience and Gold Tren Crucero travelers share accommodation in the same historical, Ecuador Cultural Heritage site; Hosteria La Andaluza at Hacienda Chuquipogio, dating back to mid XVIth century. Situated in the outskirts of Riobamba, it offers elegant rooms decorated in sober, tasteful style that matches the historical, countryside setting. 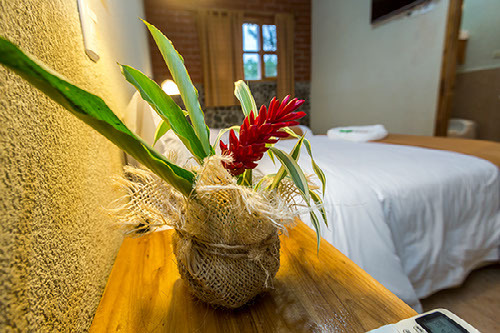 Our Gold guests will stay at the historical ranch house, in large rooms with views to the elegant gardens or the impressive Chimborazo volcano. In the heart of Quito UNESCO World Heritage old quarter and with five centuries of history, Hotel Plaza Grande stands on the corner from the Presidential palace and is built on the lot that was originally granted to Francisco Pizarro, Governor of Peru. The original building, the first colonial house built in the newly founded city of Quito, suffered multiple renovations during its long history, being home to different wealthy families. *Guidance in languages other than English and Spanish (such as Italian, French, German, Japanese) can be provided on request at an additional cost (subject to availability). Clothing recommendation: Wear layers, a jacket for cold weather and a light coat for the rain (coast). Comfortable walking shoes, hat, sunscreen with high SPF, repellant, sunglasses. Don’t forget your camera! Arrival information: On day 1, the meeting point is Duran Train Station in Duran at 7:30 am. Please plan your schedule to arrive on time.